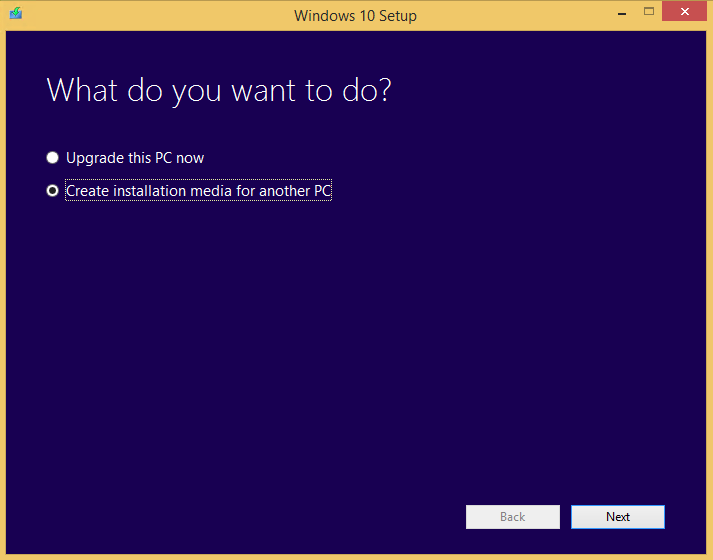 If you need to install or upgrade to Windows 10, Microsoft has released a very simple tool named Media Creation Tool to allow you to download Windows 10 to upgrade the current PC to Windows 10, or to download the Windows 10 ISO images, or to create Windows 10 DVD dic or Windows 10 USB flash media for clean installation or installing the new version of Windows on a different PC. No product key is required to download the Windows 10 ISO images, or to create DVD or USB media trough the Media Creation Tool. No product key is required when upgrading Windows 7 or Windows 8.1 that is genuine and activated to Windows 10. No product key is required (by skipping the product key entering) when clean install Windows 10 from scratch on a device which has previously upgraded to Windows 10 and gets activated in the past (hence the HWID, the hardware ID, is recorded on Microsoft activation server). The free Windows 10 license with permanent activation also applies to computers upgraded to Windows 10 final RTM Build 10240 from Windows Insider Preview Builds and pirated copies of Windows managed to trick Microsoft into believing it’s genuine. A valid Windows product key is required when directly installing Windows 10 for the first time on a device. All Media Creation Tools always download the latest RTM build of Windows 10 available, regardless of version. Run the Media Creation Tool. In the “Windows 10 Setup” window, choose Upgrade this PC now if you want to upgrade Windows 7 or Windows 8.1 to Windows 10 for free, and hit Next. To get Windows 10 ISO images, or to create a Windows 10 DVD disc or USB flash drive, choose Create installation media for another PC, and hit Next. 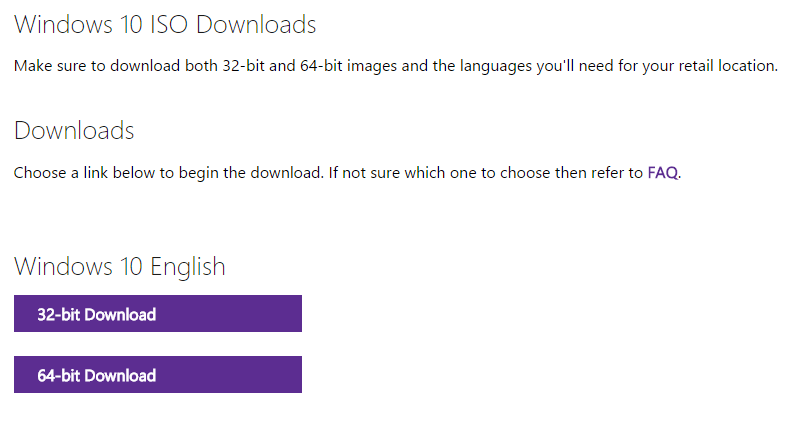 Choose the Language, Edition and Architecture of Windows 10 that you want to download. Refer to the table below to identify the appropriate Windows 10 edition that you should download, as part of Windows 10 upgrade path or to ensure selected if the one which corresponding to the license or product key you purchased. Click or tap on Next when selection is done. Select either to create a USB flash drive or ISO file as the media for Windows 10 OS downloaded. 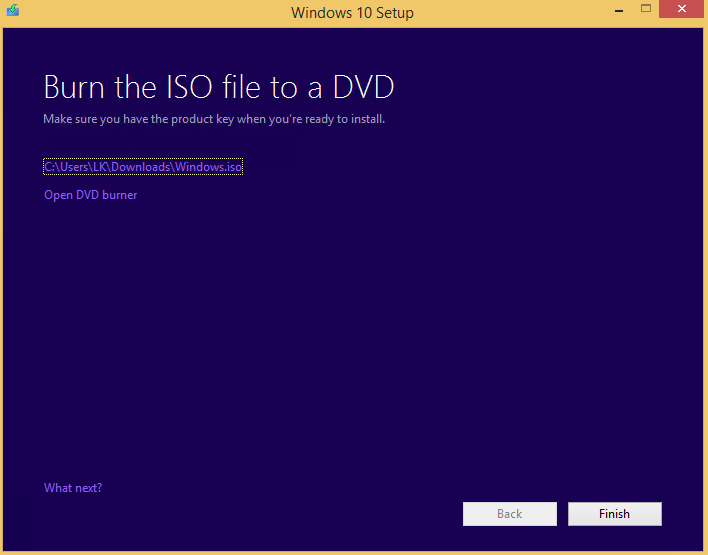 If you want to burn a DVD disc, choose ISO file. Hit Next when done. If you selected USB flash drive, choose the USB flash removable drive to be used as Windows 10 media. If the tool can’t find a USB flash drive, plug in a USB flash drive to computer, and click or tap on Refresh drive list. 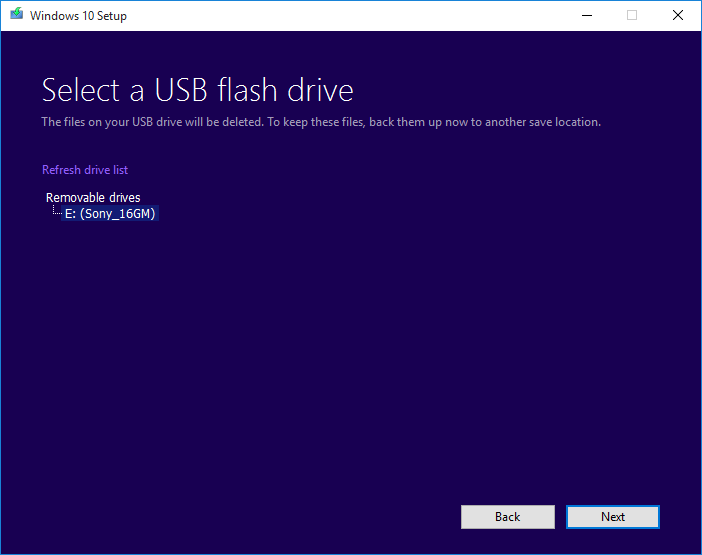 Windows 10 Media Creation Tool will format and write to USB flash drive without warning, so make sure you don’t have important files on the USB flash drive. 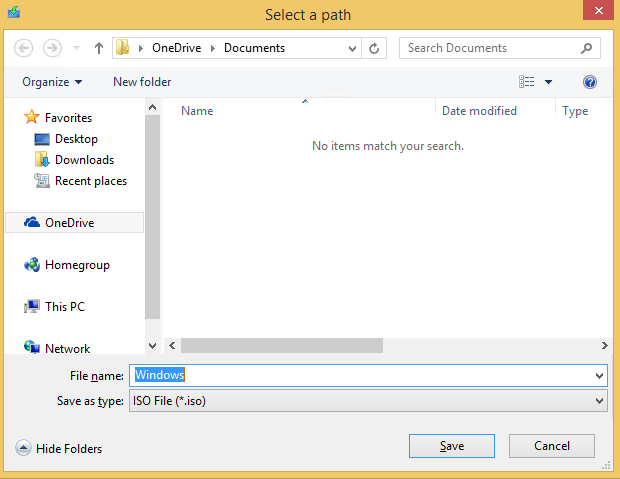 If you selected ISO file, choose a folder location to store the Windows 10 ISO image. Media Creation Tool starts to download and verify Windows 10 files with a progress status. After the download is complete, the ISO or USB flash drive media is created automatically. Select Finish to exit. In Windows 8, Windows 8.1 and Windows 10, you can directly burn the ISO to DVD disc with Windows built-in DVD burner called Windows Disc Image Burner. You can now locate the Windows 10 ISO or media at the location you specified in the wizard, and use it to install or upgrade any PC, such as using Windows 10 ISO to upgrade Windows 7 or Windows 8.1, by simply running the setup.exe. Do remember to check on Windows 10 system requirements to ensure that current system can run Windows 10 properly. The ISO images that are downloaded directly from Microsoft’s servers is completely the same and has identical file hashes with ISO images posted on MSDN and the leaked Windows 10 OEM ISO. Note that the file hashes (CRC32, SHA1, MDA and etc.) for Windows 10 ISO images created by Media Creation Tool are unique as time stamps and other factors are different for each computers. However, all Windows 10 ISO downloaded is identical, all of which the final gold master RTM release with build version number of 10.0.10240.16384. 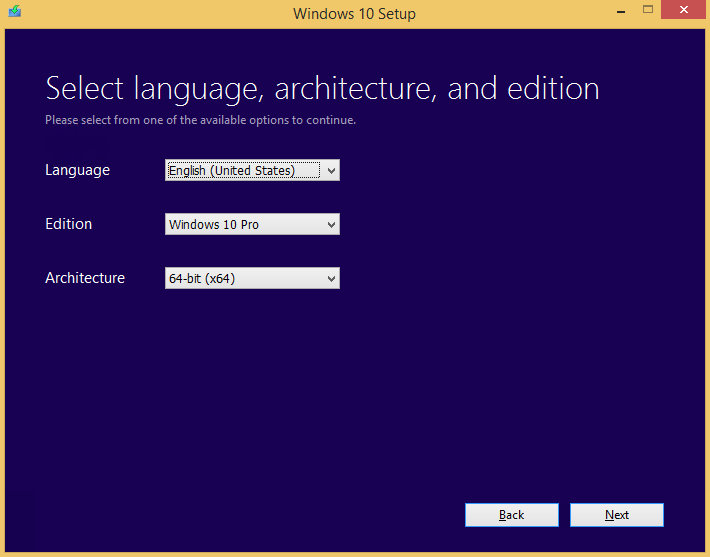 Microsoft first released the Windows 10 RTM Build 10240 to Windows Insiders, properly to test the upgrade process.